In which we indulge the kids. Our local library is awesome. It has books and online resources, but it also has events for all ages, and my kids have recently begun attending the monthly anime night for teens. That the boy was encouraged by girls at school may have had something to do with it. Anyway, next month’s meeting is Cosplay, in which the kids dress up as their favorite anime character. 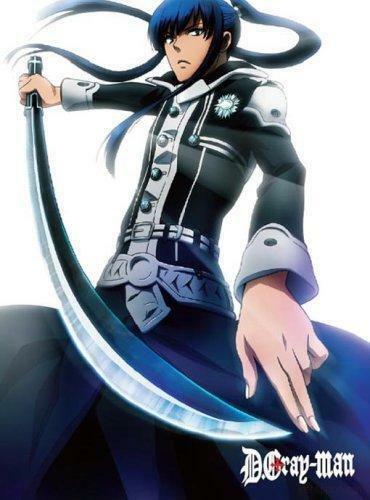 The group decided that Zavi should dress as Kanda, a mystical warrior exorcist from the D Gray Man series. I’m not sure what that means, but it involves wielding a sword and looking cool, which is I think all that matters in this case. It was decided that Katja would be Winry Rockbell, a good hearted mechanic from the Full Metal Alchemist series. Armed with reference pictures we headed to Goodwill to see what we could find. We totally lucked out finding a black trench coat (size 40) for less than $10 that could be trimmed and tailored into a Kanda-worth coat. It was a little harder to find something tween-sized to approximate Winry’s lavender coveralls. We decided that cargo pants and a matching shirt in any color would get the point across. For Zavi’s warrior, I chopped off half the front panel of the coat, added huge darts in the back, slit the sides, took in the sleeves and sides, and added lots of white trim. It’s a total hack job on the inside, but looks pretty darn good on the outside — especially by Middle School library group standards! The Winry costume was much easier. I dyed the shirt to (mostly) match the pants, sewed the two together, and added an embroidered name patch for fun (and just in case it needed any explanation). The girl took care of the rest with styling and finds in her closet. At age 11, I am happy she was more than willing to swap the tube top for a tank. I told the kids I’d look for cheap hair clip ins for added effect, but if that doesn’t happen it’s OK. Katja thinks a gold wig is just as fun as a blond one. The best thing is that the kids love the costumes and are excited for the next anime night at the library. 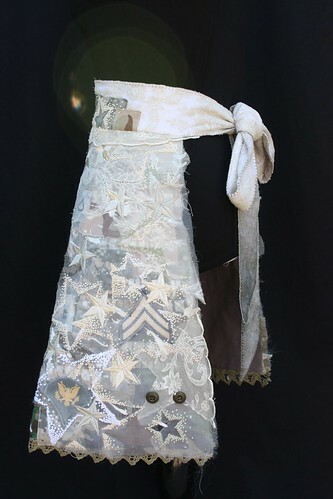 In other news, I finished the apron with a bajillion french knots. This photo is not the best (I’m experimenting with where and when to photograph things, and the sun is just in the wrong position with this combo). Anyway, I think it’s titled Non-entity, but I’m not sure yet. That means something to me, but I don’t think it clarifies anything to a viewer. For me it’s about being recognized only by one’s husband’s rank and social security number, but I’m not sure that comes through. It’s pretty though, so I’m generally happy with the piece. I’m kicking around ideas for a new series and needed to do a bit of experimentation. I pretty much know in my head what I want, and I think I know how to get it, but you never really know until you know. I wanted to try a full body sun print. So, I laid out a piece of cloth on a large plastic tablecloth, painted it, dragged it out onto the patio into the sun, and lay down on it for almost an hour, from 10:00 to 11:00-ish. The first thing I learned was that concrete is really hard when you lay on it, unmoving, for so long. I also lost feeling below my elbows. The second thing I learned is that sweat messes with the process and makes the paint spread out in flowy puddles. Neat effect, but not the one I wanted. Sweat also makes it hard to tell when the rest of the fabric is dry. My smart phone, on which I was listening to a podcast also gave up in the sun. I called uncle and went inside to try again. I figured that I was really better off trying again since it would be closer to noon and the sun wouldn’t cast unsightly shadows that blurred my face. This time, I got smart and laid out two thin sleeping mats side by side, then covered them with the plastic tablecloth. I covered that with a cotton tablecloth to hopefully absorb some of my sweat before it caused puddling. On top of that went another piece of painted fabric, and then me — this time wearing a long sleeved shirt to absorb at least that elbow to wrist sweat. I lay out for about 45 minutes, until just after noon. This was much more comfortable, and created a much crisper image. The wicking worked so well that I have two ghost hands merely from setting my hands down on my way to the prone position. Next time, I must remember to only place body parts where heavier body parts will ultimately cover the marks. I faced the sun to get a better image. I wish I had a sweat-swabber to come out with some water and a straw every five minutes and a towel to dab my face, neck and lower arms. Unfortunately, everyone was inside and couldn’t hear my feeble cries over the podcast entertaining me from the shade of the screened door. Finally, my son came out and confirmed that the fabric I was not laying on was indeed pretty dry, and I was starting to feel a bit yucky, so I came in to hydrate and cool off. Still, I got a pretty good print. I could stop with what I have, but it occurred to me that I could use myself as a stencil too, and that wouldn’t require so much time in the sun. I’ve ordered dye which I think will go through a spray bottle better than paint and will try out my theory when it arrives. Hubby wondered just how permanent the dye is. If you see me looking like a Smurf next week, we’ll know. First off, the setting is lush and rural even though it’s mere minutes outside the city. 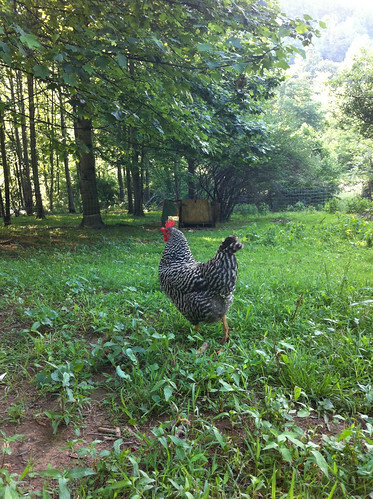 Mary Beth’s chickens run to greet you (well, psych you out as they really just run past) if you walk through their pasture. 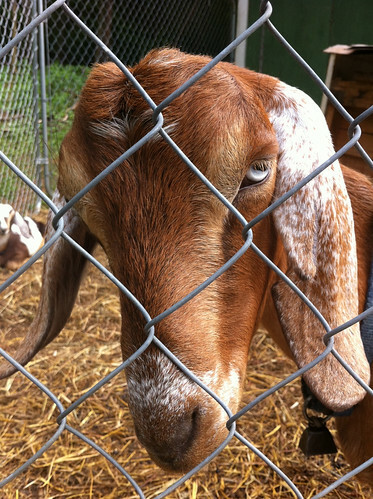 Goats provide milk each day to accompany the fresh eggs. 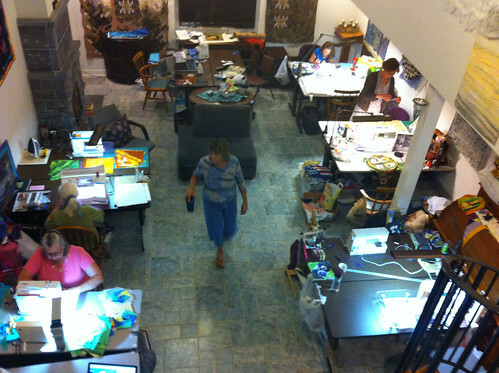 But the best part was a large family room emptied out and then filled with tables for a rotating list of local and not so local art quilters. It was wonderful to meet people with shared interests, and to see what everyone was working on. There was a large range of styles and techniques. Based on our post-game emails, everyone left inspired and energized. 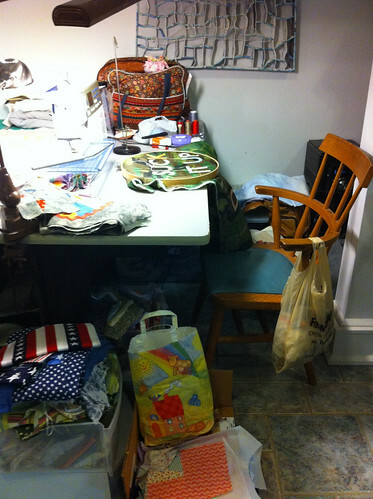 This table was my base of operations for five greatly productive days. I finished embroidering the whiskers on Zeitgeist, and started a medallion quilt that has been on my mind for at least six months. Being able to work surrounded by camaraderie and positive energy rather than groceries and laundry is a boon. 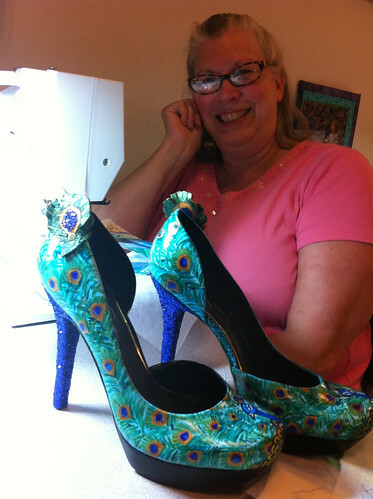 We were “serenaded” by Mary Beth’s peacocks, so Anita brought in Barb Forrister’s fun, sparkly, sparkly peacock pumps she had purchased through the Kick Off Your Heels Fundraiser. 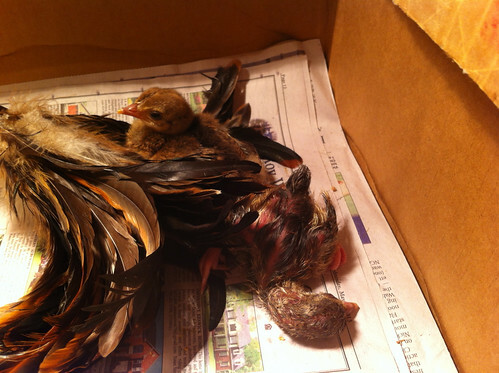 And on the last day, two peachicks hatched and brought out the mother hen in all of us. All in all a great week, and I look forward to hopefully doing it again next year. Take the Grumpy Cat internet meme, add the decorative style of schizophrenic Victorian cat illustrator Louis Wain, and make it into a quilt. What do you get? A humorous commentary on the contemporary American zeitgeist. I can’t believe I haven’t posted this yet here. I got all excited and put it on Facebook, but I guess I didn’t follow through here. So, it’s all done, and entered into the World Quilt Show at the New England Quilt Festival in New Hampshire in August. I’ll know in about 10 days if it’s accepted or not. If not, I’ll enter it into Art Quilt Elements. If it does get accepted, then I wait until the end of August to see if it wins the chance to travel one of the quilt show circuits. If it doesn’t, then again, I go the art quilt route. Right now though, I think I’m ready to send it to the Grumpy Cat people. I was going to wait until after I got notice from the quilt show just in case a juror reads their website and might be swayed, but now I’m thinking that since there are no rules as to having shown the work anywhere previously, I should just share now while I’m excited and the cat is hot. 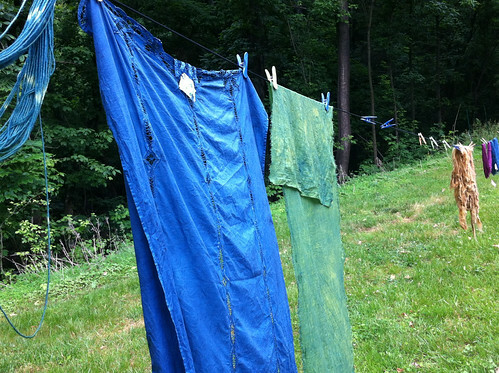 I let the fabrics sit in their baggies for about 36 hours, then I rinsed them and hung to dry. I think I left them most of the week while I went to Mary Beth’s and washed them about three days later, but now I’ve forgotten. Anyway, I was pleasantly surprised at how much the colors held. 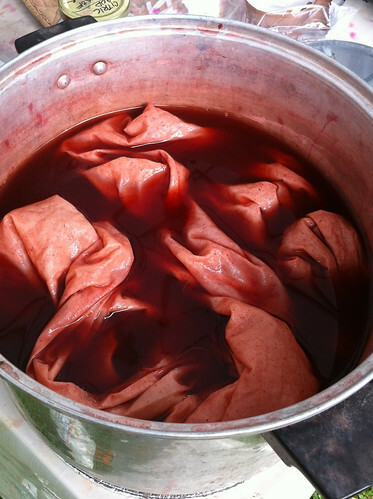 The cochineal is pretty pale,but I’m sure that has more to do with the dye pot being exhausted than anything I did. 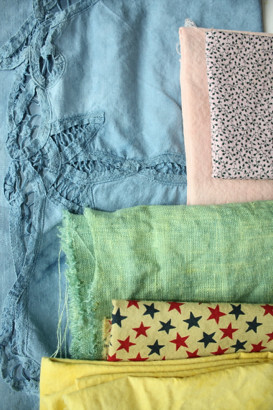 I almost used the olive stars in my retreat project, but ended up having something else in my stash that worked better. That’s fine, these will get used sooner or later. It’s Garden Doodle month on The Sketchbook Challenge blog. I decided to get in the way-back machine and show the doodles that inspired some Modern Tropical fabric designs. 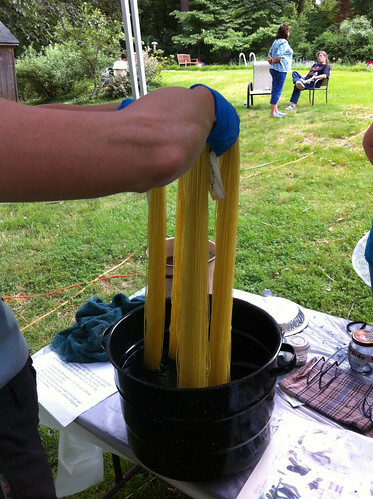 I attended a natural dye workshop today with members of the local spinning and weaving group. I like dyeing with other peoples’ stuff since they’ve already made the initial investment in tools, supplies, space, and often mess, and have done a lot of the trouble shooting too. I’ve seen and read a lot about using natural dyes, but had not yet tried any, so the day sounded like fun. Everyone brought yarn or fleece, but I asked ahead if I could bring cotton fabric, so the instructor was ready for me (she said there were always a few people with plant fiber yarns, so it was no problem). For those who don’t know, plant fibers like cotton and linen need different mordants or fixing agents than protein fibers like wool and silk. We had various colors to choose from, such as Madder (a root), Cochineal (a bug), and Poke Berry for various pinks to reds. There was Osage (wood I think), Goldenrod (flowers), and onion skins for a range of yellows, plus walnut for a medium brown. Finally, there was indigo for blue. The indigo pot was very popular. With the exception of the indigo, we used alum as our mordant. Copper and iron can be used to vary the colors achieved, but we all had enough color choices that no one bothered to ask for a special mordant pot to get more. My cotton also needed a pre-simmer in sumac to prepare it. Here it is simmering in a pot of madder. 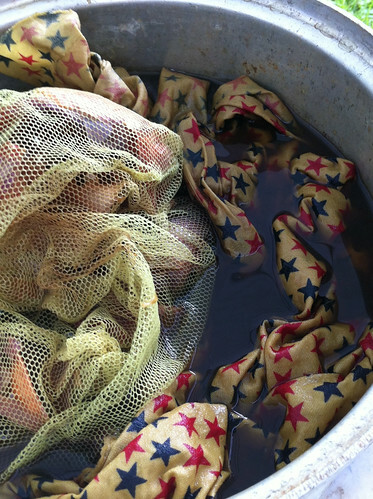 I put starry fabric in the pot of onion skins towards the end of the day and another workshopper wanted to overdye some indigo yarn. She was willing to wait so as not to taint my fabric, but I was up for experimentation. Hopefully, we both get some variation of olive green. Indigo, and then a linen blend fabric (I think) first dyed in turmeric for a bright yellow and then quickly dipped in the indigo. I really like the way the rough weave took the color unevenly and heightened the textural look. 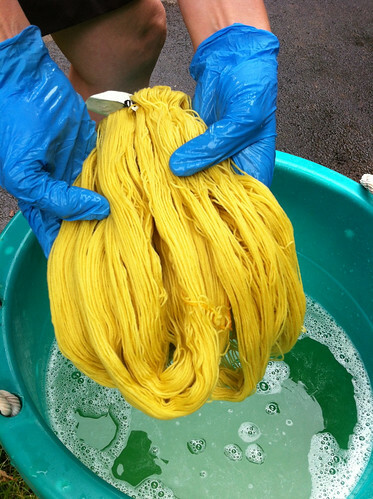 Our hostess rinsing her goldenrod dyed yarn in preparation for an indigo dip. She got a lovely grass green. 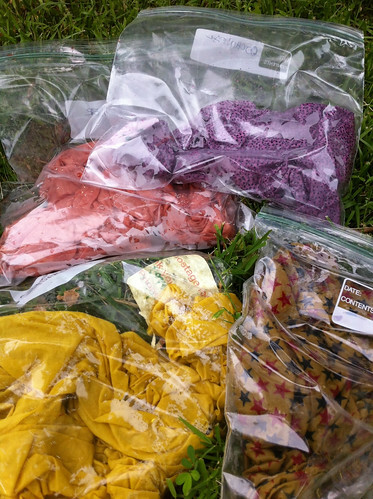 The rest of my fabrics: madder, cochineal, turmeric/goldenrod, and onion skins/indigo. It was a one day, casual, intro to natural dyeing, so we did a lot of simmering rather than just set and wait overnight or for weeks. We kept it all pretty simple. I am letting my fabrics “batch” overnight (at least) in their bags and will let them all cure for a few days before I wash them out. The colors should be pretty permanent, though it’s hard to tell while they are wet just how intense they will or won’t be. I’ll share pictures of the finished product in a week or so.